We here at the Gazette love a good crate or barrel! With the live-action adaptation of Beauty and the Beast hitting screens nationwide this evening, it felt like the perfect time to belly up to the tavern bar and have ourselves a belt. The question is, with all of the choices in Gaston’s Tavern what should we choose? Barrels cover not only the registers of the establishment, but also line the wall behind him. These five varieties split between seven barrels offer intriguing options, but sadly you can only order a glass of Lefou’s Brew. Let’s explore what’s in a name, or in this case five names. Trois Blondes Biere – Translated simply means Three Blondes Beer. This in in reference to the three blondes who all dream to one day be wooed and wedded to Gaston. While regularly referred to as the Triplets, the three do have names. Claudette (red dress), Laurette (yellow dress), and Paulette (green dress) are seen in a majority of the film’s scenes that include the townsfolk, but are not part of the mob that launches an offensive on Beast’s castle. IgerBock – This one shouldn’t need much of an explanation as it relates to the Walt Disney Company’s Chief Executive Officer, Bob Iger. A Bock beer is a strong, dark lager that is typical released in spring months. IgerBock also plays off of the true name of bock beer, Einbeck, to northern town in Germany where the beer originated. Staggs Ale – This barrel is a nod to Tom Staggs who was the chairman of Walt Disney Parks and Resorts at the time New Fantasyland and Gaston’s Tavern opened. He would later become the Walt Disney Company’s Chief Operating Officer before he and the company agreed to mutually part ways in the spring of 2016. An ale is a type of beer that is typically produced without any hops and have a sweet, fruity flavor. 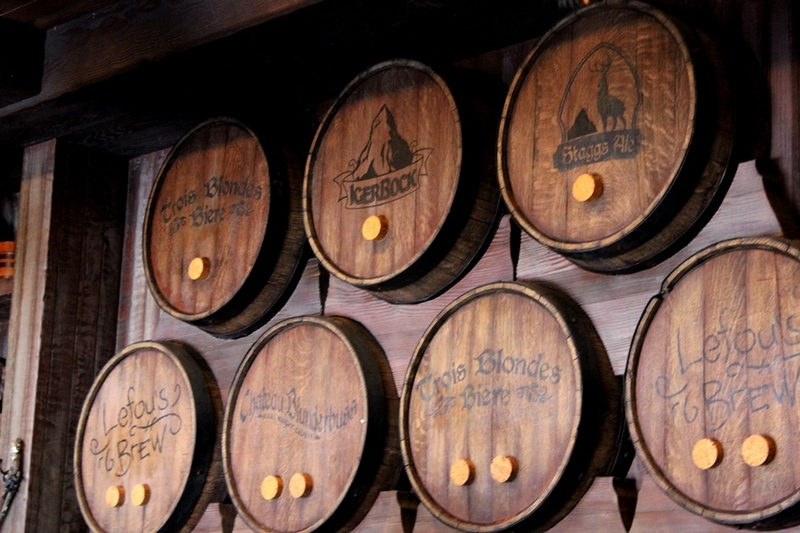 LeFou’s Brew – Named for Gaston’s sidekick, LeFou’s Brew is the only barreled beverage that is actually served at Gaston’s Tavern. It is a frozen apple juice concoction that has a hint of marshmallow and is topped with passion fruit-mango foam. It will go straight to your head, in the form of an ice cream headache. Chateau Blunderbuss – Chateau is actually a wine term for the name of a vineyard or estate in which it was brewed, which makes us look to the under the name for the second line of text, which reads “Biere Haught Caliber.” A blunderbuss is Gaston’s rifle of choice, while the estate of Chateau Blunderbuss clearly has worked up a high caliber beer. I hope you found the right beverage for your next stop in at Gaston’s Tavern, even if you’re only playing pretend with LeFou’s Brew with your family on that visit!